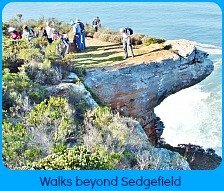 Sedgefield walks are the best way to get introduced to our great outdoors. Not only is walking a healthy past-time but its enjoyable to find your bearings around our small village on foot. It costs nothing and is available to all ages. And it certainly is no hardship to be out in our scenic environment breathing in fresh unpolluted air! And its a good idea to have these numbers programmed into your cell phone. Remember though its possible that you could find yourself without cell phone coverage at times. Don’t walk alone – depending on where you’re going – you could get lost, you could twist an ankle or have a fall, you could have an unpleasant encounter with a stranger. Let someone know where you’re going – you never know – for many reasons, you could be very thankful! Don't encourage a break-in by leaving valuables or enticing items in your car where they can easily be seen. Finally - Check our great local newspaper, The Edge, for the high/low tide times. It can make all the difference when you plan a beach walk. The paper comes out bi-weekly on a Wednesday and it’s free! It can be found in our local supermarkets and many other shops and at their office on the north side of the N2. Turn right after crossing at the robot and some distance up the road, you'll see it on the left-hand side. Or you can find it in the right hand column near the top of this page! From Sedgefield, drive on the N2 in the direction of George. Take the first turn left to Swartvlei after crossing the bridge over the lagoon. The Links Golf Course will be on your left and shortly after seeing the camp site at the base of the dune, just follow the tar road that ends at the car park overlooking the beach. Walk westwards(i.e. to your right) along Swartvlei beach to Gericke’s Point and beyond (best done at low tide) to explore the numerous fascinating rock pools. One can climb the Lion's Head to whale watch and take photographs. You can cool down in the safe shallows of the beach or snorkel in the rock pools. 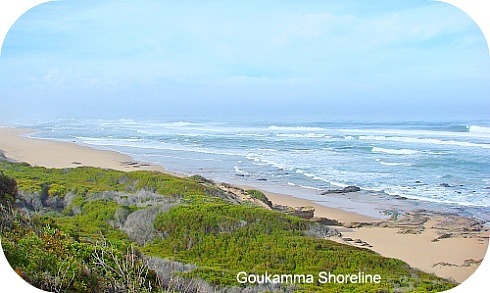 You can traipse beyond Gericke’s in search of some interesting shells or just smother your senses in the relatively unspoilt seashore wilderness experience. The coastline is spectacular and the sea air, invigorating. The distance is 3kms return trip but depending on your interests, it’s easy to make a half day or even a day of it. This is one of the most rewarding and repeatable of Sedgefield walks. 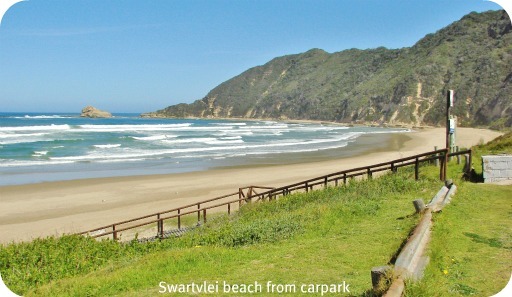 From the parking lot at Swartvlei Beach you can hike in the opposite direction from Gericke’s, towards the river mouth, 2kms return trip. 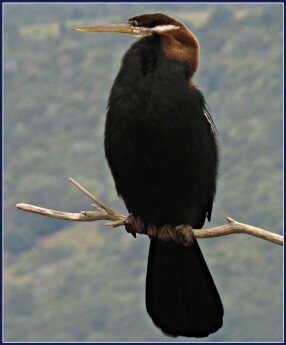 If the mouth is closed, you can go further along Myoli and Cola beaches, even on to Platbank – round trip +/- 11kms. You can get off the beach at Myoli and have a cup of coffee, lunch or a snack at Pilipili Beach bar before heading back to your car. 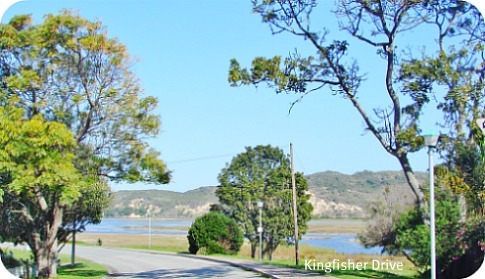 Drive up Kingfisher Drive along the lagoon to the river mouth and leave the car in the car park. Tramp down the boardwalk and then rounding the point you can stroll along Myoli and Cola Beaches as far as you’re fit for. Either return the same way or climb over the dune to one of the Myoli or Cola beach car parks. This will give you some view points from which to do some whale or dolphin watching. 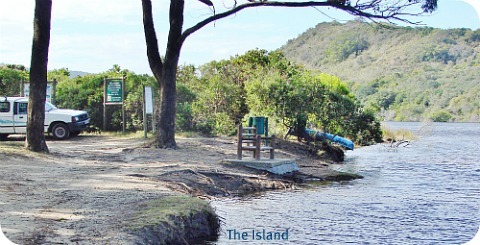 Then you can foot it back along Claude Urban road and enjoy some refreshments at the Myoli Beach coffee shop or lunch at Pilipili, with your feet in the sand, before following the road past the Kingfisher development back to the river mouth car park. Park your car in the grassy open area just off Kingfisher Drive. Crossing over the road, turn right to hike alongside the lagoon (so the lagoon is on your left-hand side). Keep walking in front of Placid Waters Timeshare and on round the lagoon to the causeway crossing over to the island. Keep left and at the first stop street, turn left into Moodie Street, then right into Andries Pretorious. This road becomes President Steyn and there is a bench where you can sit and enjoy the bird life on the lagoon. Further down at the corner, President Steyn meets Charles te Water, and it gets even prettier. You can sit on the grass, paddle or swim. Keep walking on around the island. You will have seen by now that it is a peaceful residential area. You can’t get lost. The whole round trip, depending on your variations can be from 6–10kms. Definitely take your camera for this special one of Sedgefield walks! The Dune on the North side of the N2 national highway is called Cloud 9. You can leave your car at the station and hike along the railway track (which is no longer in use) turning left at the dirt road that is Egret Street. You stay on the road as it takes you through some pine plantation. You keep getting some enticing glimpses of the village and once you’re close to the top, an area opens up which allows you to have spectacular unimpeded views of the town, the lagoon and the ocean beyond. If you keep walking, on the right days you will come across the paragliders’ launching sight and observe their obvious enthusiasm for their activity. 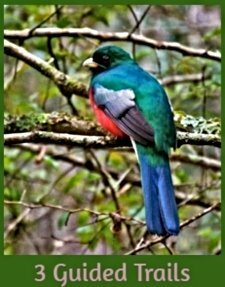 You might even decide to book a tandem flight for an unforgettable bird’s eye view of Sedgefield. 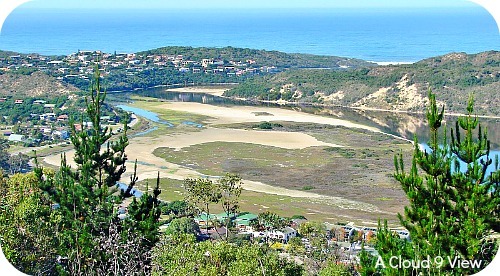 Once you resume your walk, you will get to see the extent of Swartvlei Lake on the other side of the dune and tramping down the dune, you will pass through the Outward Bound School and eventually get to the N2 on the east side of Sedgefield beyond the Engen garage. In the vicinity of the garage, there is a Wimpy and a number of other coffee shops at Scarab and the Mosaic Markets where you can obtain refreshment. You will then have to stride back along the N2 or you can once again walk along the railway line (that you will see before you get to the N2) that will take you directly back to the station. The round trip is 10-12kms. 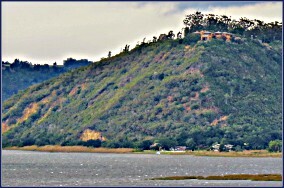 In your car drive towards Knysna and just outside of Sedgefield turn right to Lake Pleasant. 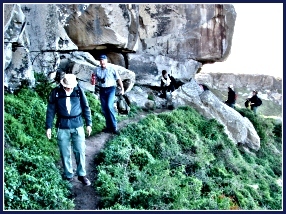 Follow the road past the campsite on your right and climb the hill turning left to Cape Nature. After about 2kms, you will find a clearing to park your car. 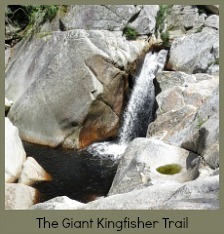 There are a number of trails in this area so it is best to get a map from Cape Nature. 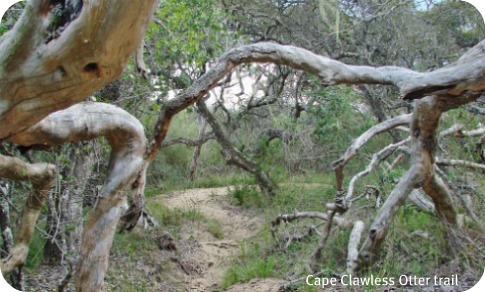 This trail is in the Goukamma Nature Reserve and takes you through some dune forest down to the Groenvlei, along the lake through some reed beds then into the forest again before you climb out into fynbos. You continue to hike along contour lines over the dune towards the sea. You travel down in similar fashion into the valley and up and over the next dune winding your way down to the oyster beds on the shore. 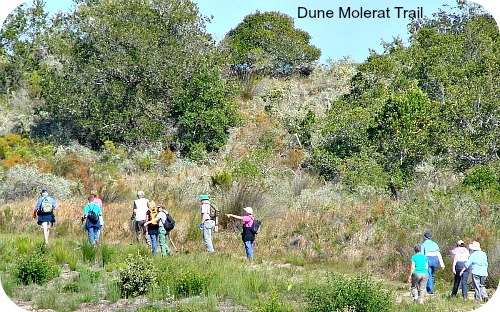 You have amazing vistas at various times in all directions and walk through some wonderful dune forest and beautiful fynbos. (We were lucky to have a good viewing of 2 hump-backed whales when we did this trail) The beach walk back to Platbank (in the direction of Sedgefield) is also most enjoyable. You take the boardwalk off the beach there and traipse back along the dirt road turning right at the top to get back to nature conservation where your car is parked.Try to choose a cool day for this walk as in the heat of summer, it can be very hot. NB. This is one of the Sedgefield Walks that I recommend people do not walk on a very hot summer's day. 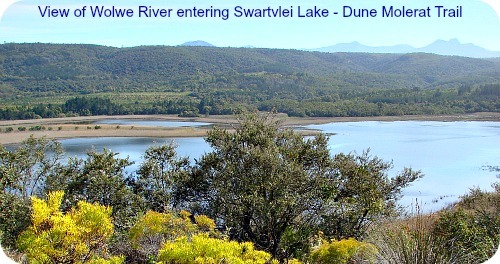 Drive by car towards George and 1km after crossing the Swartvlei, turn right at the sign indicating Pine Lake Marina. Park in the open area opposite the entrance to Pine Lake Marina. Continue on down the road to Trails’ End and when you come to the end of the road veer left next to the resort facing you and walking next to the complex on a broad grassy path, you will reach a locked gate. Climb over the stile there for that purpose and carry on following the path. Shortly it will veer to the right past an old house with a few outbuildings.Turn immediately left so you pass them now on your left. The path starts to climb the dune through flowering fynbos (there’s always something flowering!) 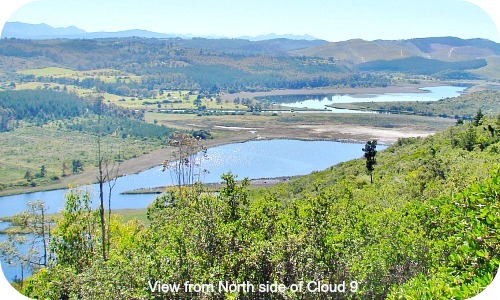 and soon you have panoramic views of Swartvlei Lake and you'll see one of its feeder rivers, the Wolwe River as well. There is a timely beacon where you can sit and drink your fill of the magnificent scene before you. When you can drag yourself away, you carry on hiking and the path swerves left and the bird sanctuary of Rondevlei appears in the foreground with Langvlei just beyond it. 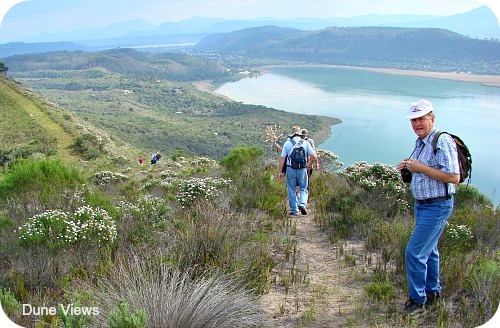 Follow the path down to the vlei and arrive at a gravel road. 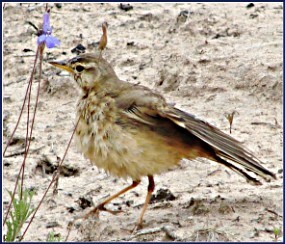 Turn right and follow the road past Cape Nature buildings and you will arrive at the Rondevlei Bird hide. Depending on the time of day, you can now partake of your refreshments whilst watching any number of birds going about their regular business. 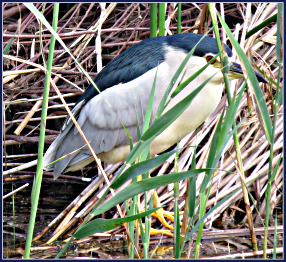 You might even catch a glimpse of an otter or two. Return the same way you came, leaving the dirt road where you came on to it. Instead of going back up the hill, turn right at an open track that will take you on a level path back in the direction of Pine Lake Marina. Returning this way you will come to a shady Pine plantation on the left of you and in a short space of time you will find yourself back at the car park. 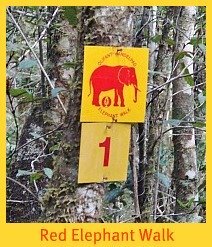 Guided trails - Contact Mark Dixon of Garden Route Trails.